To produce the highest quality durum, growers need to develop a management plan which considers agronomic and variety selection as well as understanding the requirements of pasta manufacturers and end users. Durum yield potential can be influenced by sowing date and variety choice. Correct nitrogen application timing is essential. Too much applied nitrogen can result in durum setting an unattainable yield potential. Harvest durum at less than 12.5 percent moisture and aim for protein at 13 percent. To reduce chaff and whiteheads make sure harvester settings are correct. Use www.grdc.com.au/GRDC-FS-Durum to ensure your link remains current and up-to-date! 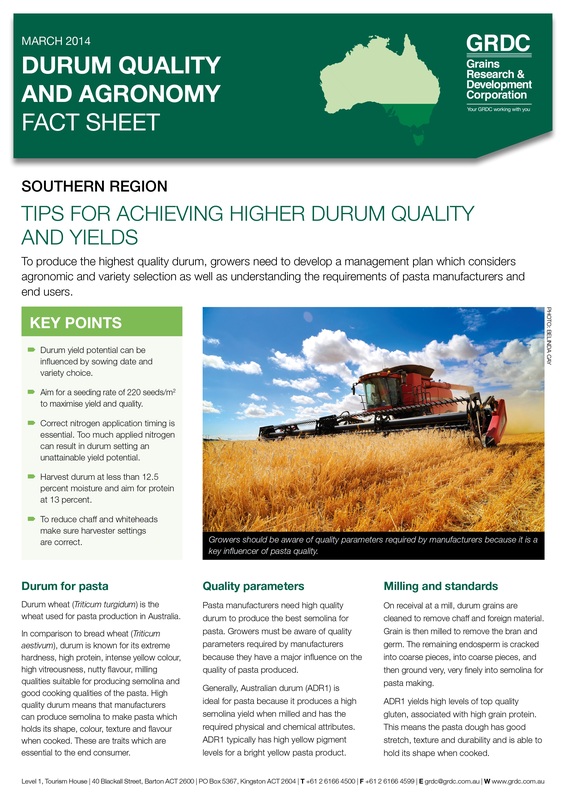 361.27 kb Durum Quality and Agronomy Fact Sheet: Tips for achieving higher durum quality and yields To produce the highest quality durum, growers need to develop a management plan which considers agronomic and variety selection as well as understanding the requirements of pasta manufacturers and end users.